Jezebel from the Bible was the wife of Ahab, king of Israel. She was a Phoenician princess, daughter of Ethbaal king of the Zidonians. In her hands, her husband became a mere puppet. The first effect of her influence was the immediate establishment of the Phoenician worship on a grand scale in the court of Ahab. At her table were supported no less than 450 prophets of Baal and 400 of Astarte. 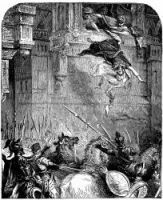 The prophets of Jehovah were attacked by her orders and put to the sword. At last the people, at the instigation of Elijah, rose against her minsters and slaughtered them at the foot of Mt. Carmel. Because of Jezebel's involvement in the death of Naboth, she was cursed by God. 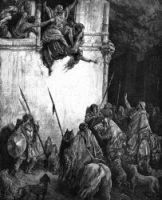 The curse was fulfilled many years later by King Jehu, who found her in Jezreel and had her body thrown from an open window. 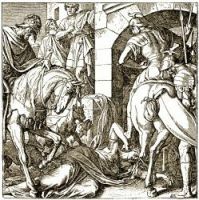 Jehu trod upon her with his horses and she died a gruesome death. Later, when Jehu's men went to bury Jezebel, all they found were her head, feet, and part of her hands. The rest of the body was gone, eaten by hungry wild dogs, just the way Elijah had prophesied. These Jezebel Bible illustrations are from my collection of Bible stories. Feel free to use these Jezebel pictures in your projects. Click on the Jezebel Bible images below to see more details about saving a free image or about purchasing a higher resolution image of Jezebel.